Stamped concrete has coloring and a “stamp” applied to it to give it a unique look. It may look like cobblestone or pavers. It can have the appearance of rough-hewn stone or brick. It can even be made to look like wood! It’s a long-lasting alternative that’s easy to care for. It can be mopped, swept or hosed down. Every couple of years it should be resealed to keep the color locked in and to protect the concrete. But that’s about it; there’s no difficult maintenance schedule to follow! The appearance is so realistic that most people don’t even notice the difference. And you won’t get splinters. Or trip over loose bricks or cobblestone, or the corner of that paver that’s uneven. But you get all the great looks of those materials. Let’s start out front. How would you feel about a great driveway that looks like it came right out of colonial times? The look of cobblestone gives a great color and appearance to the approach to your house. Prefer something simpler? You could have a regular concrete drive but with borders in stamped concrete so that it looks like you have a brick trim running all along the way. Walkways and entryways are other elements you can spruce up when having new concrete poured. Make it seem like you have pavers or cut stone right up to the door. 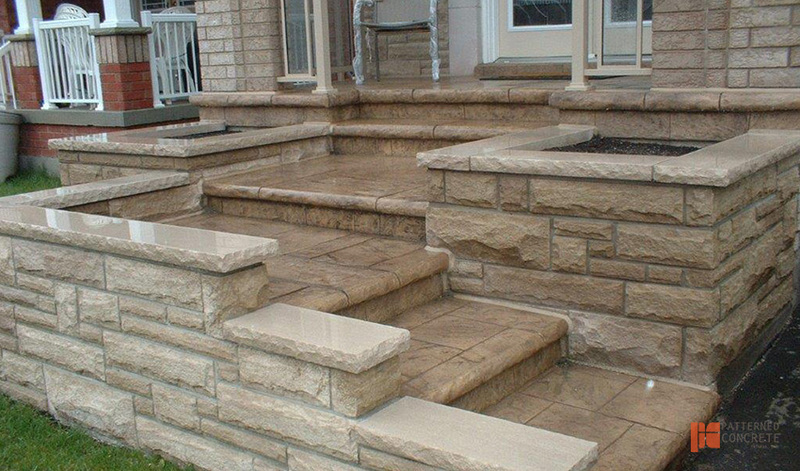 There’s nothing stopping you from having the step themselves in stamped concrete, too – and that includes the risers (the vertical part of the step). It’s also great to know that heated driveway and walkway system can be installed under your stamped concrete. There’s nothing that prevents this. And when winter comes, you can have a more comfortable and safer way out of the house. Out back, there’s even more you can do with your space. Want a tiled patio, completed with flower boxes and even a fire pit, all fashioned with the same design? That’s all possible. If you have an outdoor kitchen, you may be looking for a different look and feel altogether. Real granite countertops are probably the best way to go, but your floor and the frame under your counter can really stand out when done with this decorative material. If you have a big yard, why not turn it into several “rooms”? Set apart a sitting area, a dining space and the grill master’s domain. Make the distinction more obvious by using different styles in each. You can even leave a short paved walkway between them. A path through your garden is a fantastic option as well. A cut-stone look can make you feel like you’re far out in the wild with its rough appearance. Or maybe a wooden path lined with bricks is more the look you’d like. 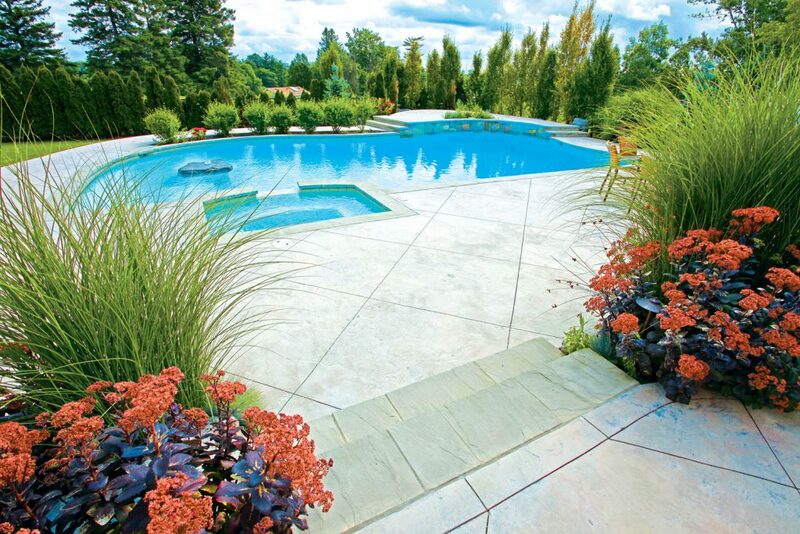 Even around your swimming pool, stamped concrete goes great. Imagine being able to have a “wood plank” deck without the risk of splinters. How about making it seem like red brick but without the risk of stubbing your toe? Those are just a couple possibilities. Another advantage is that concrete stays cooler than a lot of other surfaces, so you won’t feel as uncomfortable walking on it! Why Choose Stamped Concrete Over Other Materials? Stamped concrete has several advantages over other materials. One is the creation of a smooth surface. Of course stone of any kind or treated wood is going to hold up over time. But as soil underneath other stonework settles, you have more uneven edges. That increases the risk of tripping. Nails that hold wood together can work loose and create other safety risks.But concrete avoids these by maintaining a uniform surface. Concrete will, of course, settle as well. And fine cracks will appear. But your contractor knows how to “guide” where future cracks will form. That means they can direct them to less-conspicuous areas. Another advantage is maintenance. If you put down stone, odds are that you’re going to have to pull up weeds. With stamped concrete, you’re dealing with a single surface that only appears to have space between stones. That means less yard work! Finally, there’s the price. Stamped concrete is competitive with or beats the price of other types of surface. While having the “real thing” does have its benefits and prestige, you can save money and have the same great look. 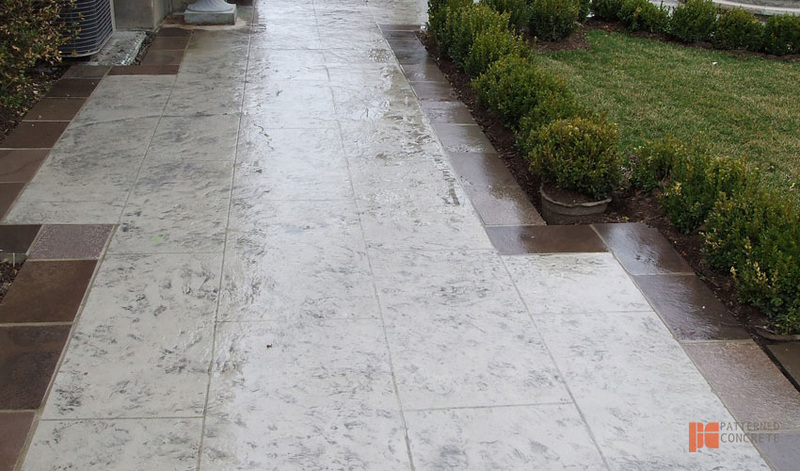 Stamped concrete is a great way to spruce up your business or home. Dozens of designs are available and can add charm and character to your property. For a reasonable cost, you can have the great look you see in the finest estates! NEED COLOUR IN YOUR CONCRETE?